Someone once told me I was wasting my achievements of Bachelors and Masters degree by being a stay at home mom. They also said I went from riches to rags. Yes, it may have looked that way when I chose to leave my $113k/yr job to stay home to be a full time wife and mother. I’ve worked as a military officer leading over 100 troops with multi-million dollar contracts, I was involved in national security projects working at the pentagon, provided leadership for security of Air Force One at Andrews AFB, and served as a successful consultant and leadership/executive coach in the D.C. Area for three of the 15 executive departments of the U.S. Cabinet…and yet…the most challenging and rewarding calling to me is being a wife and mama. I went from combat boots, to high heels, to bare feet. I say ‘bare feet’ because the calling of motherhood is on holy ground–I finally understood the importance of a mother. The truth is I went from rags TO riches. I went from my filthy rags of my own self-sufficiency and dependency to God’s glorious riches!! The world can’t appreciate the spiritual investment of what God is doing in and through us as mamas. Sometimes we doubt it too. **Disclaimer** This is not written to invoke condemnation on moms that work outside the home. A mother’s work is never done, and is always full time. I remember what it’s like to be a full time mama serving in the military, knowing at any time I could be deployed. It’s not easy. I remember what it’s like to be a full time mama that works full time outside the home. It’s not easy. I remember what it’s like to be a full time mama that stays home full time. It’s not easy. I know what it’s like to be a full time mama that home schools. It’s not easy. I know what it’s like to be a full time homeschooling mama with a part time job. It’s not easy. The calling of every mother is sacred and holy. 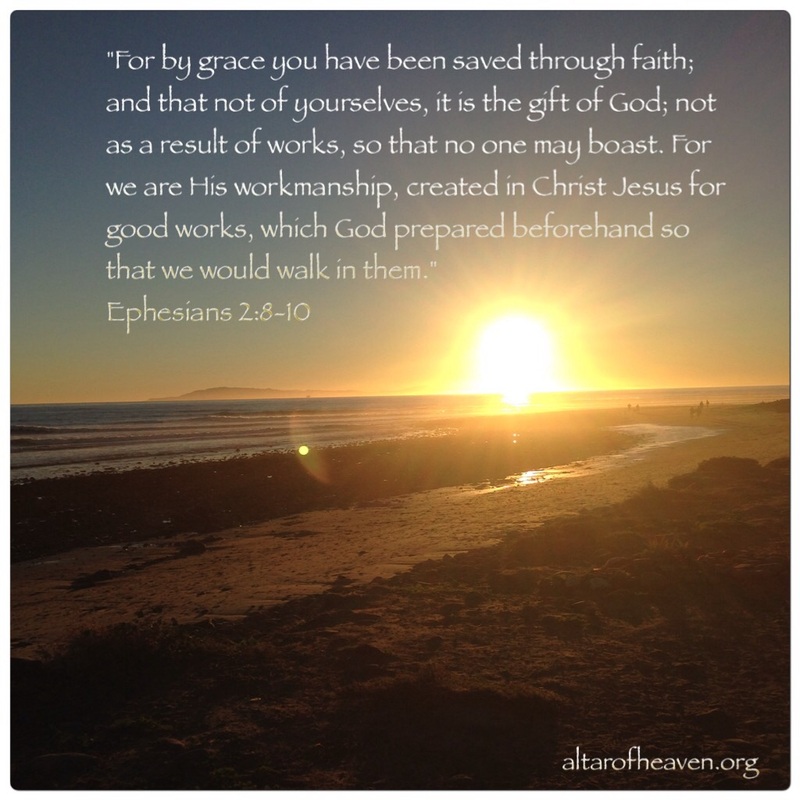 This is the story of God’s grace in my life. I just needed a season of purification to learn to put my priorities in place and I was exclusively working in the home, but recently have had a part time job, and next month I will be working in a director’s position for a Company where I get to encourage other mothers. This is the path and good works God has for me. Follow the convictions God has given YOU and be at peace. To read more about my conversion and the testimony of the grace of God in my life click here. Have you ever experienced a tribulation, distress or affliction that was so overwhelming it was beyond what you could handle? What a great word picture because it feels like “a pressing” weight when I’m afflicted. Eternal life can begin now with KNOWING God and Jesus Christ who He has sent. Unite yourself to the One that can carry you–Jesus Christ. In whatever affliction you may be enduring, may you be encouraged BeLoved. One of the main reasons I joined the military was to be part of something bigger than myself. In June 1996 I saw the news report of the Khobar Tower bombing in Saudi Arabia where 19 servicemen were killed, and it evoked a restlessness in me to make a positive impact on this evil world. As an ambitious 20 year old I was afraid I would miss my calling in life and was mobilized to join the fight of defending our freedom. Five months later I stepped off a bus the dawn before Thanksgiving enduring humiliation and lots of yelling, and I began to understand just a small amount of what it means to sacrifice. God used the military in so many ways to reveal how He had uniquely designed and equipped me. I LOVED being in the military…the structure, the camaraderie, the sense of purpose of being part of a mission that mattered. I was made to be a soldier–a soldier of Christ. There is a real spiritual war going on and many casualties are dying without knowing they have access to God through Jesus Christ! All those years in the military I knew about God but I didn’t have a saving relationship with Him as I do now. Today I KNOW God and I KNOW my purpose: to Know Him and Make Him Known by bringing glory to His name. I am so thankful for all of the Christians I met in the military that were lights shining, ambassadors for Christ, serving alongside me, asking me to be reconciled to God through Christ. You know who you are. You not only served our Country, but were on a spiritual mission which made an eternal impact. I am still a soldier. My allegiance is to the only One who holds all things together, the only One who sustains freedom—His name is Jesus Christ. Will you join me in this ETERNAL MISSION? *Thank you my fellow Veterans of the U.S. Military you are LOVED. God HAS blessed America–He has forgiven the world of our sins because of the sacrifice of JESUS CHRIST. 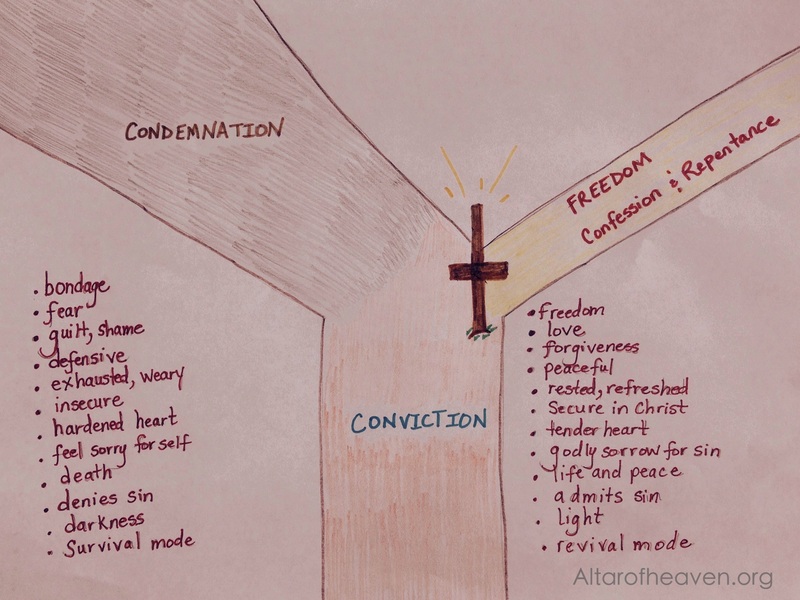 Conviction is a pathway leading to the CROSSroad of condemnation or freedom. The narrow road to freedom comes through Jesus Christ as we confess and repent of our sins. Daily we get to choose whether we will walk in condemnation or freedom. The choice is ours but so are the consequences. May we walk and live in faith by the Spirit. Today she is hidden with Christ in God!